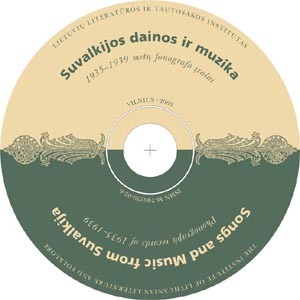 With the release of this CD the publishing of the phonograph records collected at the Lithuanian Folklore Archive in 1935–1939 has been started. Demanding many a meticulous work of restoration they present us the ancient folk songs, the sounds of various folk instruments and dialectal patterns of different ethnographic regions. A relatively small area of Suvalkija – the districts of Marijampolė and Vilkaviškis – is presented by the first CD’s songs and instrumental music. This region’s songs sung by the singers Agota Mikulevičienė, Magdalena Radzevičienė, Vincas Kazimierskas, Marė Žemaitienė, Marė Arnastauskienė and instrumental compositions performed by the musicians Juozas Radzevičius, Jurgis Gudynas, Jurgis Byla, Jonas Stadalnikas, Pranas Puskunigis have been included into it. 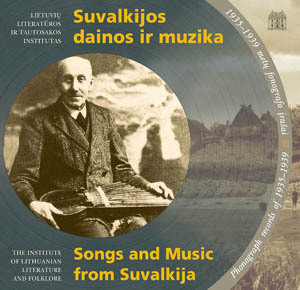 A song recorded from Martynas Jankus by whom the tradition of Lithuania Minor is reflected has also been selected for the collection Songs and Music from Suvalkija. The CD contains a vivid examples of the songs of different genres such as rye reaping, wedding, family songs and those of youth and love. It is worth mentioning that all the songs of 1935–1939 of Suvalkija represent one-part singing, they are characteristic of a peculiar monodic expression: refined melodic lines, variable modal structures, changing metres, subtle ornamentation of the melody. Likewise vocal music, this region’s instrumental music put on phonograph records feature the traits of the monodic style. The bulk of instrumental tunes contained in the collection were played by monodic musical instruments – the fiddle, the reed-pipe and the whistle. Popular polkas were prevalent in the repertory of the fiddlers from Suvalkija, and thus a great diversity of means of expression and melody patterns contained by them have been presented in the CD. The preference to playing waltzes, marches, schottisches, krakowiaks, mazurpolkas by musicians of Suvalkija of the early 20th century is also evident. Considering the repertory of the playing on the kanklės it should be noted that not only melodies of dances but also those of songs were played on them. The listeners could be interested with the performance of famous musician Pranas Puskunigis from Skriaudžiai (who founded the kanklės ensemble and issued a manual on this instrument). In the book “Songs and Music from Suvalkija” texts, melodies, comments, and performers’ photographs are provided.